Cabbage aphid, winged form. This soft bodied, pear-shaped insect is usually wingless and about 1.5 - 2 mm long. The wingless female is pale yellow green. The winged migrant form has a yellowish green abdomen with a dark dorsal blotch. Winged forms migrate to other hosts in late spring. During these migratory flights, aphids may spread virus diseases from infected volunteer plants and weeds to healthy crop plants. Green peach aphid (Myzus persicae) . Adult wingless females are 1.2-2.1 mm in body length and very variable in colour. Black bean aphids (A. fabae) colony (nymphs and alates) on leaf of runner bean (Phaseolus coccineus). Note the presence of an attendant ant (Lasius sp.) and, in centre of the picture, a hymenopteran parasitioid ovipositing into the aphids. A. fabae is a dark brownish to matt black aphid. Adults are often bigger than other Aphis spp. Apterae 1.5-3.1 mm, alatae 1.3-2.6 mm. Groundnut aphid (A. craccivora) colony on cowpea. Apterae are 1.4-2.2 mm long. Alatae (winged form) 1.4-2.1 mm. Black legume aphid / Groundnut aphid (Aphis craccivora) is a relatively small aphid. Immatures are slightly dusted with wax, adults without wax. Apterae are 1.4-2.2 mm long. Alatae (winged form) 1.4-2.1 mm. Cotton aphid (Aphis gossypii) is a small aphid. Adults range from just under 1-1.5 mm in body length. Some images of these aphid species are found under 'more images' and under the specific crop pages. Both adults and nymphs pierce plant tissues to feed on plant sap. Their feeding may cause rolling, twisting or bending of leaves. Heavily attacked leaves can turn yellow and eventually wilt. Aphids feeding on flower buds and fruits may cause malformed flowers and fruits. Aphids excrete a sugary, sticky liquid called honeydew that accumulates on leaves and branches. Sooty moulds (a fungal growth) grow on honeydew deposits turning leaves and branches black. Heavy coating with honeydew and sooty moulds may reduce photosynthesis, affecting plant growth and yield. Honeydew is a favourite food of some ant species. 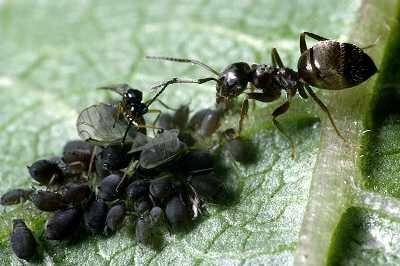 Thus, black ants are commonly found on plants with aphid infestations. These ants protect the aphids from natural enemies and are therefore considered indirect pests. Ants may even transport aphids from plant to plant. Many species of aphids have been implicated as major vectors of plant viral diseases. Seedling stage, vegetative growing stage flowering stage and generative stage. Growing points, stems, leaves, inflorescences, fruits and whole plant. Curled leaves, abortion of flowers, stunted growth and dieback. Sooty black mould becomes evident in heavy infestations. Black ants are very common in plant with aphid infestations. However, sooty moulds and ants are also associated with other honeydew-producing insects such as mealybugs, scales and whiteflies. Eggs are very tiny, shiny-black, and are found in the crevices of bud, stems, and barks of the plant. Aphids usually do not lay eggs in warm parts of the world. 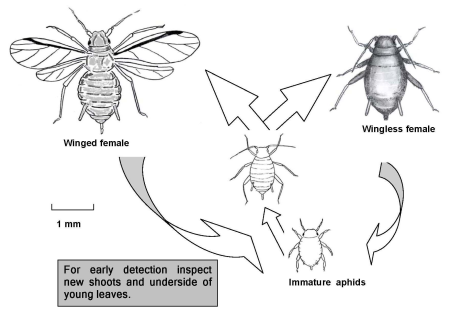 Nymphs (immature stages) are young aphids, they look like the wingless adults but are smaller. They become adults within 7 to 10 days. 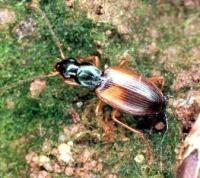 Adults are small, 1 to 4 mm long, soft-bodied insects with two long antenna that resemble horns. Most aphids have two short cornicles (horns) towards the rear of the body. The mouthparts are needle-sharp, resembling tiny straws. Their body colour varies from black, green, red, yellow, pink, white, brown, greyish, or purple. Adults of the same species may be wingless or winged (with two pair of wings). Winged aphids are usually dark in colour. 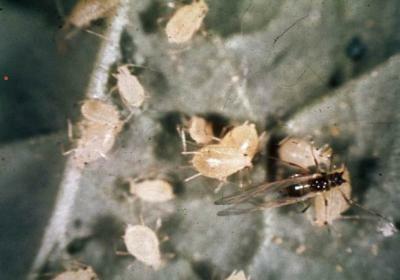 Wingless forms are the most common; winged aphids are produced when they need to migrate, for example under overcrowded conditions with limited food source or when environmental conditions are unfavourable. Aphids have complicated life cycles. Females can reproduce with or without mating. 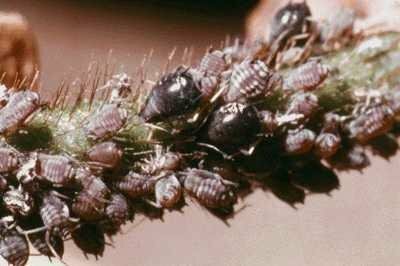 Female aphids may lay eggs or give birth to wingless offspring, known as nymphs. In the warm parts of the world, as in the tropics, no male aphids are produced and female aphids do not lay eggs but give birth to small nymphs. A female can produce from 20 to over 100 nymphs. Young aphids grow quickly, becoming adult in about one week and start to reproduce. Thus the numbers increase rapidly under favourable conditions. Aphids live in clusters (known as colonies) on leaves and stems. Initially they are present on tender parts of the plant (young shoots and leaves), but as their number increases they can cover the whole plant. As the colony grows winged aphids are produced which fly away looking for new plants to start a new colony. Warm and dry weather is particularly favourable for rapid increase of aphid numbers. Further below you find concrete preventive and curative methods against Aphids. It is particularly important to scout crops during the critical periods of seedling and shoot growth and during flowering and fruiting. To monitor aphid populations, examine the undersides of the leaves and the bud areas for groups or colonies of aphids. Presence of ants may indicate presence of aphids. Early detection of aphids is important as they can multiply rapidly. Therefore, the crop should be scouted regularly. Yellow traps are useful for monitoring the arrival of winged aphids to the crop. The presence and abundance of natural enemies should also be recorded. For more information on monitoring traps click here. Economic threshold levels have been developed for some few aphid species. One example is the threshold level for cotton aphid (A. gossypii) on cotton in Sudan: if 30% of the plants are infested during the first 2 months of the season, treatments are recommended (Stam et al., 1994). However, damage thresholds depend on many factors (crop stages, crop age, economic and climatic conditions). Instead of trying to use threshold levels, the growth of the aphid population within 3 to 5 days should be monitored. If a rapid growth of the number of aphids per plant is observed, and no or only few predators (e.g. ladybird beetles, lacewings) are present, treatments should be planned. 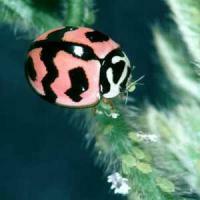 Most plants can tolerate moderate numbers of aphids without great damage. However, even small numbers may need to be controlled in cases where aphids transmit virus diseases. Prompt control is necessary when numbers build-up and natural control is not satisfactory. Grow healthy plants. Healthy plants are able to protect themselves better from pests and diseases than weak plants. Growers are strongly recommended to use compost in preference to manures, including liquid manures. Excess use of manures and mineral (artificial) fertilisers, particularly nitrogenous fertilisers, produces fleshy plant tissue attractive to aphids. Therefore their use should be avoided as far as possible. Practice crop rotation. This may help to reduce aphid infestations, particularly of aphid species that are host specific (they feed and develop only on one or few plant species). Grow crops in mixed cropping. This involves plant diversity by growing diverse plants on the same land and at the same time. Common mixed cropping includes use of companion planting and intercropping. The mixture of plants needs to be carefully chosen. For instance, intercropping poses a problem when the minor crop harbours a disease or pest of the primary crop. Mixed cropping is in general beneficial to natural enemies, since it provides food and shelter. Depending on the plants used and the pattern of cropping, mixed cropping may help disrupt the lifecycle of pests and maintain their population below the economic threshold level. An example of a good intercrop in cabbage production is onions. Use trap crops: some crops are particularly attractive to pests and can be used to trap them and protect the main crop. Monitoring of the trap crops is very important. They should be destroyed when they become severely infested, and before they are killed by the pest, or have completed their lifecycle, as the pest may move from the trap plants to the main crop. They can be removed and buried. Trap crops can be planted around the field to be protected, or interspersed among the rows. Trap crops such as dill, nasturtiums, and timothy grass near the main crop are reported to avoid aphid infestations in the main crop (The Bug Lady, 2004). Anise, chives, garlic, onions, radish, and parsley are reported as good companion crops (Elwell and Maas, 1995; KIOF). Onion, chives, garlic and Mexican marigold repel aphids. The Kenya Institute of Organic Farming (KIOF) recommends leaving a few plants of Mexican marigold between the crops. Intercropping beans with maize is a common practice in East Africa. It has been shown that infestations of black bean aphid in common beans were greatly reduced when intercropped with older and taller maize plants in a study in Kenya (Ogenga-Latigo et al., 1993). Numbers of the aphid Aphis gossypii decreased in potatoes that were intercropped with onions (Allium cepa or Allium sativum). To achieve this reduction, the onions had to be planted within 0.75 m of potato plants (Potts MJ, Gunadi N, 1991). The most important aphid predators are predatory bugs (e.g. Anthocoridae, Miridae, Nabidae), carabid beetles (Carabidae), soldier beetles (Cantharidae),predatory gall midges(Cecidomyiidae), lacewings (Chrysopidae), ladybird beetles (Coccinellidae) and hoverflies (Syrphidae). In addition, parasitic wasps (parasitoids) are often involved in the control of aphid populations. Parasitised aphids can be easily recognised. They turn brown and hard and remain stuck to the plant surface. They are known as "mummies". Depending on climatic conditions and crops fungi that cause diseases of insect pests (entomopathogenic fungi) can contribute to a rapid decline of aphid populations. Natural aphid enemies usually appear with a certain delay because they react to the presence of aphids. Habitat management. For instance, leaving or growing flowering plants at the boarder of the crops or as companion plants within the crops attracts beneficial insects. Controlling ants feeding on honeydew produced by aphids. They disturb natural enemies giving protection to the aphids. Ploughing and flooding the field destroy ant colonies and expose eggs and larvae to predators and sunlight (Elwell and Maas, 1995). Carabid beetle (Agonum dorsale) (6 to 8 mm long). 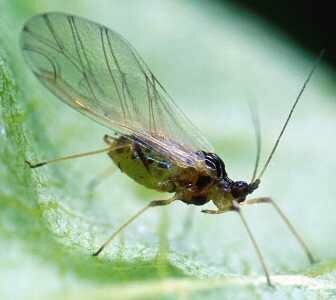 An important predator of many aphid pests and the eggs of several dipterous (fly) pests. 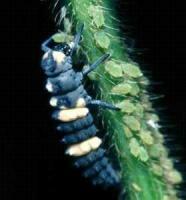 Ladybird beetle larva of C. sexmaculatafeeding on aphids. Ladybird beetle (Coccinellidae sexmaculata) adult feeding on aphids. The adults are pink and black. 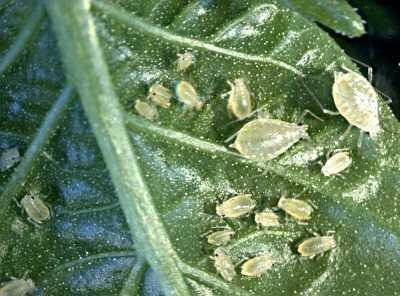 Neem extracts can control early infestations of some aphids, but they are not efficient against all aphid species. For a reliable and satisfactory control neem extracts must be applied at an early stage of aphid attack. Usually repeated spot sprays of affected plants are necessary to achieve control. Neem has a slow mode of action, and usually effects are not visible before 10 days after application. Some neem extracts (e.g. oil extracts) may be phytotoxic. Therefore, test the extract on few plants before going into full scale spraying. Neem products have in general no or low negative effect on natural enemies. However, products based on neem oil have stronger effects on some natural enemies. Pulverise 100g chillies in a mortar, shake vigorously with 1 litre of water and filter through a cloth. Dilute 1 part of this mixture with 5 parts of soapy water before spraying (G. Stoll, 1988). As a general spray soak green leaves and seeds in water for 24 hours, filter and spray (Elwell and Maas, 1995). Yellow sticky traps and yellow water traps are mainly used to monitor winged aphids. As the yellow colour attracts many insect species, including beneficial insects, use these traps only where necessary. 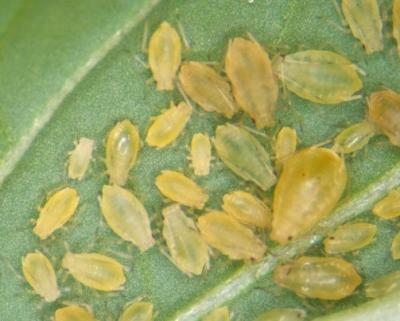 Half-filled yellow pans or basins with soapy water are placed close to the plant but exposed enough so that aphids are attracted by the yellow colour. Water traps are mainly used to monitor winged aphids. As the yellow colour attracts many insect species, including beneficial insects, use water traps only where necessary. To make your own sticky trap, spread petroleum jelly or used motor oil on yellow painted plywood, 6 cm x 15 cm in size and up. Place traps near the plants but far apart enough to avoid leaves sticking to the board. Sticky yellow traps are mainly used to monitor winged aphids. 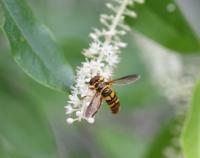 As the yellow colour attracts many insect species, including beneficial insects, use water traps only where necessary. Spray with insecticidal soaps or with a soap and water solution. This control aphids and does not seriously affect natural enemies. Mix 1 tablespoon of dishwashing soap or 3 tablespoons soap flakes (non detergent) with 4 litres of water. Add soap to water. Use mild soap or potash-based soap. Start with a lower concentration and make adjustments of the strength after testing on few infested plants. Always try on few infested plants before going into full scale spraying. Soaps can cause burning of leaves (phytotoxicity) on sensitive plants, like brassicas and certain ornamentals. Make 2 or 3 treatments in a 3 to 4 days interval for a better efficacy. Apply on the infested plants thoroughly, including the undersides of the leaves. Spray early in the morning or late afternoon to avoid phytotoxic effects on crops. Soap spray may injure foliage. Test these sprays on few leaves before applying to the entire plant. It may take 2 days for damage symptoms to appear. For more information on soap sprays click here. For a description of flour preparation click here. 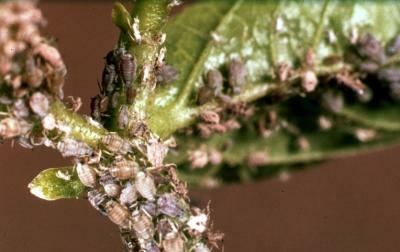 Ash can be used to effectively control aphids in vegetables. Ash should be dusted evenly onto infested parts of vegetables. Also aphids can be controlled by spraying wood ash mixed with soapy water and or lime (Elwell and Maas, 1995). Gabriele Stoll: Natural Crop protection on the tropics. AGRECOL 1988. c/o OKOZENTRUM, CH-4438 Langenbruck, Switzerland. KIOF - Kenya Institute of Organic Farming, Nairobi. Ogenga-Latigo MW, Baliddawa CW, Ampofo JKO, 1993. Factors influencing the incidence of the black bean aphid, Aphis fabae Scop., on common beans intercropped with maize. African Crop Science Journal, 1(1):49-58. Potts MJ, Gunadi N, 1991. The influence of intercropping with Allium on some insect populations in potato (Solanum tuberosum). Annals of Applied Biology, 119(1):207-213. Stam PA, Abdelrahman AA, Munir B, 1994. Comparisons of control action thresholds for Heliothis armigera, Bemisia tabaci and Aphis gossypii on cotton in the Sudan Gezira and Rahad regions. Crop Protection, 13(7):503-512; 20 ref.